Farmville 2 and Zynga have released the next set of FarmVille 2 Quests! 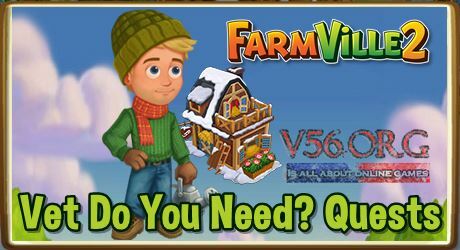 You can now start working on the Farmville 2 Vet Do You Need? Quests such as the Looking for Assistance, Forming an Application, Animal Testing, Room To Groom, I’m Guinea Be Tough, Papers Please. You have the chance to complete this Farmville 2 Quests from Tuesday January 22nd to February 5th. Quest 1 : Looking for Assistance! Buy any 2 Baby Animals. Quest 2 : Forming an Application! Perform 10 helpful actions on Neighbors’ Farms. Quest 3 : Animal Testing! Have your sweetie or kid do 1 Cave Exploring job. Quest 4 : Room To Groom! Quest 5 : I’m Guinea Be Tough! Feed 4 Adult Guinea Pigs. Quest 6 : Papers Please! Quest 7 : Some Manual Work! Collect 7 Vet Training Manuals. Quest 8 : A Welcome Party! Make 4 Angel Food Cakes.